When you are asked for your blog's RSS, you need to know where to find it on your blog. It's a special file that is easily understood by computers, and it's not designed for people to read directly. Then there are other people who have personally installed their blog software- The location of the RSS file varies with every blogging software package. These people are probably already aware of where their RSS file is located at. When people input your RSS link into their blog reader program (www.bloglines.com is an example), they will be instantly alerted when you post something new on your blog. There is no need for you as the blogger to email everyone to let them know that you put up something new on your blog. 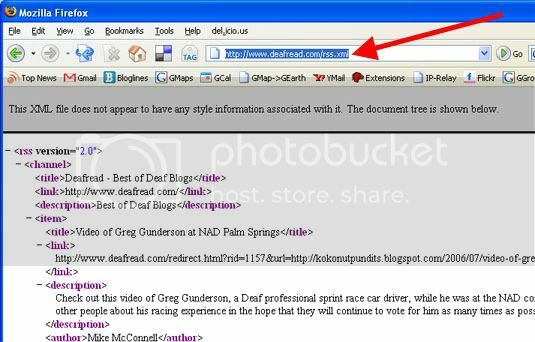 This is how DeafRead.com is able to automatically notify the human editors that there are new entries to review. 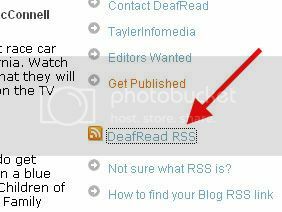 A few of you have asked me explain in simple and plain English on how to use the DeafRead RSS link. You are likely to start seeing these RSS icons starting to pop up everywhere on the web and you may be wondering how the heck you can get a good use out of these weird looking files (click on the RSS link to see what I mean by weird looking). Basically, these RSS links are to be used by RSS Readers so that they can watch for any new posts on many blogs and alert you when there is something new to read. This means that you don't have to visit all those blogs everyday just to see if there is something new to read. You just open the RSS Reader to see if they are any new, unread items. There are many RSS readers out there for PC, Mac, Linux, etc. Even Firefox, Safari, and the upcoming IE 7.0 can handle the RSS links. For this example, I'll use my favorite RSS Reader, Bloglines, that anyone can use on the web. If you register your account at www.bloglines.com, then you can follow these instructions. Now highlight the link and copy it. 1. Go to www.bloglines.com and login your account. 3. Select 'Subscribe to this URL' and click the arrow. If you are just starting out with your new bloglines.com, just click the submit button at the bottom of the page. Now you can see that I have (43) unread items for the DeafRead blog. You can also see that I have (2) unread items for the Ridorlive blog. 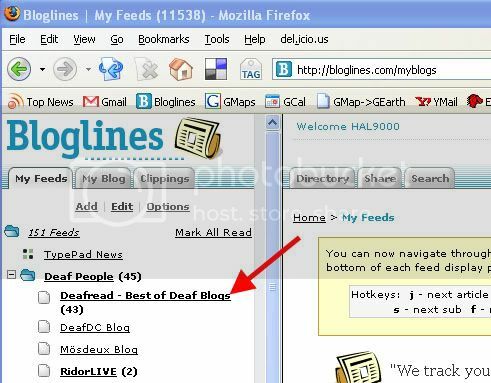 Click on the DeafRead link and you'll see all the unread entries in the window next to the list of blogs. Also note that after clicking on DeafRead, the count of unread items becomes zero and doesn't show. The next time you visit bloglines.com and there is something new on DeafRead you will see a number that tells you how many unread items you have.